This article is about how to create a DVD image of your machine with the exact same software included on the disk. This can be done using a software called Relinux. Relinux is a fork of the recently discontinued Remastersys. The image created with Relinux can under no circumstances be greater than 4 GB, which is why you will need to exclude the home folder as well as possible other folders too big to include. Furthermore, at the time of this article's writing Relinux is only compatible with GRUB2, needs an X11 display and installs metacity. 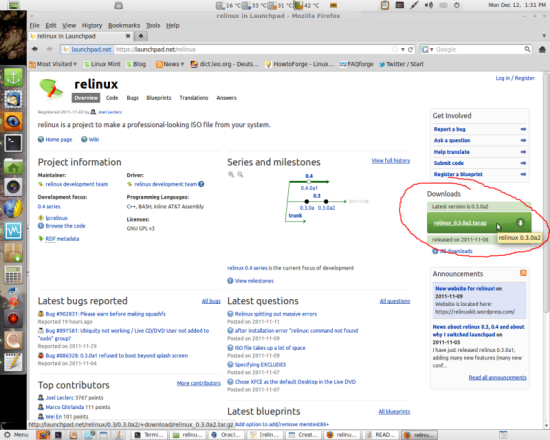 I have tested Relinux on Linux Mint 11 and it works properly on my machine. To download Relinux, visit its launchpad site under https://launchpad.net/relinux and get the latest version. Relinux should now be properly installed. You can find further documentations in the /usr/share/doc/relinux/README file. 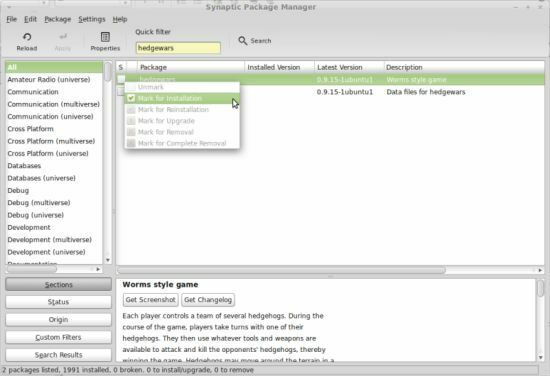 To create yourself a unique distributable Ubuntu DVD you need to install the software you want on it on your current system. 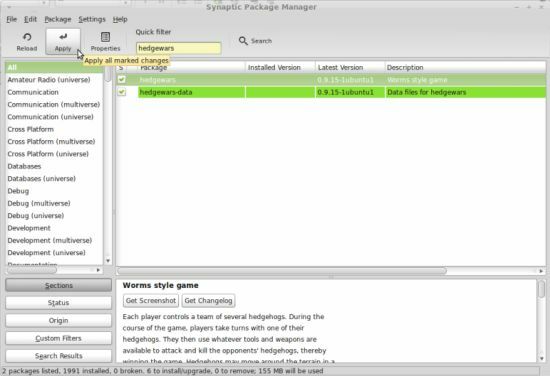 Do this by opening Synaptic Package Manager and use the search bar to find the packages you want to install. 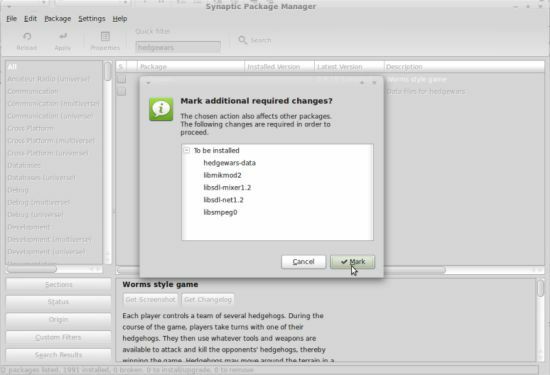 Click the checkbox right next to the package and select Mark for Installation. Most packages will need to install more packages they're dependent on, you will need to Mark those too. After you have selected all the packages you want, click the Apply button. All software you have installed on your current system will later automatically be transferred to the iso-image of you DVD. Make sure that the content you want on your DVD does not exceed the size of 4GB! Otherwise Relinux will not produce an .iso file out of the filesystem! It is highly recommended to have a look at all the options in the config file and adjust them to your liking. If you do not exclude enough files to bring the squashed file system to a maximum of 4 GB, Relinux will not create an image out of it. Additionally there are other helpful options like the choice of a boot splash screen or the naming of the actual image. Since you most likely want to use the image you create for burning it on a DVD you should pay attention to the summed size of software and files you add to it. Every file created with Relinux will be placed in its temporary directory, which by default is /home/relinux. That counts for filesystems as well as for images (e.g. custom.iso by default). Be sure you move your image to some other place since this temporary folder will be emptied on the use of fullclean. If you have a home folder that is to large to put it on a DVD but still have files that need to be on the image, there are two ways you can put them on it; one has to be dealt with before you create the file system and one that can also be done after it has been created. To add files to your non-backup image before you create the file system, just put them into the /etc/Skel folder to let the files appear in your home folder on the image afterwards. The /etc/Skel folder is responsible for populating the home folder on every installation and every adding of a new user. In this example the folder bla is the one containing the extrafiles folder. See the man page for further switches and options. The most common way to use this command should be combined with the destination switch. Make sure to choose an unexisting directory as destination since it will give you an error otherwise. You said, "Relinux is a fork of the recently discontinued Remastersys." "Contrary to some rumours floating around the internet, Remastersys is alive and well." It's not alive and well any more. I have decided to stop development of remastersys and it will no longer be available. Thank you for this awesome guide! Helped a lot. Hope for some more great guides in the future.